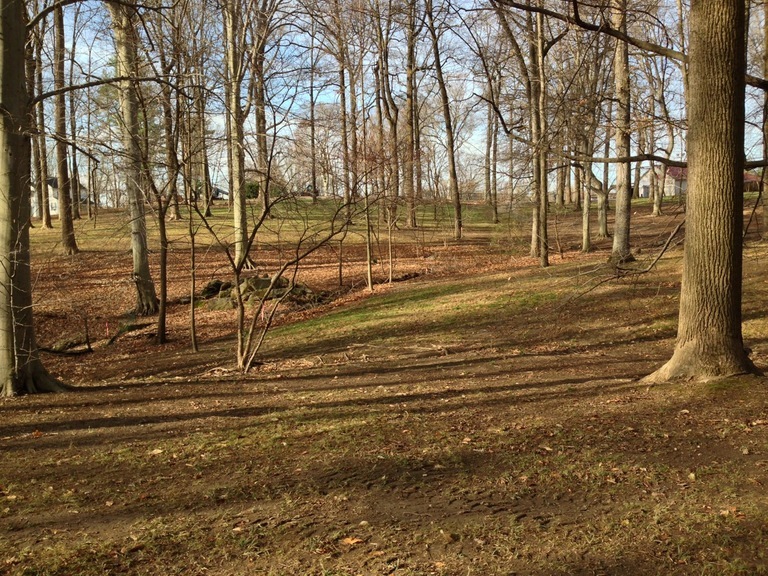 View through Symphony Woods looking southwest to Merriweather Post Pavilion, showing mixed forest and lawn landscapes. Click for a higher-resolution version. Image credit: Frank Hecker. tl;dr: I recap the history of Symphony Woods and the various attempts over the years to develop it as a park. This article in the “Creating the Chrysalis” series explores the long and tangled history of attempts to create a park in Symphony Woods prior to the adoption in 2013 of the so-called Inner Arbor plan, which aims to create a new park for downtown Columbia, Merriweather Park at Symphony Woods. 1963-2007. From the creation of Columbia to the transition from the Rouse Company to General Growth Properties as the developer of downtown Columbia, a long era in which Symphony Woods remained undeveloped and (for the most part) out of the spotlight. 2008-2009. An intense period of controversy over GGP’s plans for downtown Columbia in general and Symphony Woods in particular (as part of what GGP called the “Merriweather” neighborhood), and the beginnings of the Columbia Association’s own efforts to create a park in Symphony Woods. 2010-2012. The beginning of the present era of downtown Columbia development, with the adoption by Howard County of the Downtown Columbia Plan, including designation of the combined “Merriweather-Symphony Woods” neighborhood, the transition from General Growth Properties to the Howard Hughes Corporation, and the continuation of and ultimate hiatus in the Columbia Association’s project to develop a Symphony Woods park. In October 1963 developer Jim Rouse surprised Howard County officials and residents by announcing his intent to build a planned community on almost 14,000 acres of land recently acquired by a joint venture between his company and Connecticut General Life Insurance. Of those almost 14,000 acres, approximately 150 acres, or just over 1% of the total land area, were reserved for the downtown area of what was to become Columbia, Maryland. Among the promised amenities for the planned community of Columbia was an extensive system of pathways, open space, and parks, including a 40-acre tract of wooded land in Columbia Town Center that evolved into what we know today as Symphony Woods. However the simple story told in the marketing material was complicated by the decisions made by Rouse and his associates. First, within the woods at the town center Rouse planned an amphitheater proposed as a summer home for the National Symphony and a venue for other cultural events. In hopes of soliciting donations from Washington heiress Marjorie Merriweather Post, when completed in 1967 this amphitheater was christened Merriweather Post Pavilion—although in the end Post did not contribute any funds to construct or maintain it. The surrounding wooded land, now named Symphony Woods and comprising 37 acres, enclosed the 10-acre Merriweather Post Pavilion site on all sides, so that all access to the amphitheater required traversing Symphony Woods. Second, while deeding Symphony Woods itself to the newly-formed Columbia Association, Rouse retained ownership of the Merriweather Post Pavilion site as well as a crescent-shaped property to the west and south of Symphony Woods, bordered by Broken Land Parkway and US 29. This latter property, in a prime location for intensive office, retail, or residential development, was kept as open space pending the future build-out of downtown Columbia. These two decisions determined the fate of Symphony Woods for the next several decades. On the northern part of the property (next to Little Patuxent Parkway) the woods were treated as simply an extension of and access point to Merriweather Post Pavilion. This was especially true after a series of gatecrashing incidents at Merriweather rock concerts in the 1970s led to Symphony Woods being closed to non-ticket-holders while events were being held at the pavilion. Meanwhile the western and southern parts of the wooded area (what we know today as the Crescent property) resembled a public park to some extent but were actually Rouse-owned land, with only private roads across Rouse property providing easy vehicular access to these parts of the woods. The result was underuse of the general Symphony Woods and Crescent areas outside the context of Merriweather Post Pavilion. A children’s petting zoo operated in those areas during the summer month in the 1970s and early 1980s before closing due to lack of business. The annual Maryland Renaissance Festival was also hosted there during roughly the same time period, before it was moved to a dedicated site in Anne Arundel County. No new uses emerged to replace them until the early 1990s, around the 25th birthday of Columbia. In 1993 the first Wine in the Woods festival was held, while in 1994 the Symphony of Lights Christmas display was created. The former was held in Symphony Woods itself, while the latter mainly occupied the Crescent property, with only a relatively small portion of the display in Symphony Woods proper. 1993 and 1994 also saw the first attempts to develop Symphony Woods as a true park, as the Columbia Association contracted with Land Design Research (later renamed LDR International), a landscape design firm founded by former Columbia planner Cy Paumier and his associates, to study ways to increase the use of Symphony Woods. LDR International recommended creation of a pathway around Symphony Woods (i.e., circling the Merriweather Post Pavilion property), with a more formal park entrance and boardwalks over environmentally sensitive areas, a formal garden and separate wildflower plantings, seating for picnickers, and a “sound garden” with hidden speakers or fountains. The Columbia Association chose not to pursue this plan. Five years later in 1999 LDR International again presented a Symphony Woods proposal to CA, and again no action was taken. More years passed until 2003, when in April discussion of downtown Columbia development was revived by a Rouse Company request to Howard County to increase limits on residential density to support up to 2,100 new residences in Columbia, including new residential development on the still-unused Crescent property. Later that year Howard County Council member (and future County Executive) Ken Ulman and Columbia Association board1 member Joshua Feldmark attempted to revive the idea of developing Symphony Woods as a park. Again, nothing substantial resulted. In 2004, eight years after Jim Rouse’s death, the Rouse Company was purchased by General Growth Properties. As a consequence of the acquisition GGP assumed the Rouse Company’s privileged role with respect to planning and zoning in Columbia: Under the “New Town” zoning scheme originally created by Howard County, only the Rouse Company, and now GGP, could request zoning changes in Columbia, even in the case of properties like Symphony Woods that were owned by others. That same year, amidst uncertainty over the future of Merriweather Post Pavilion, a citizens advisory panel produced a report that recommended “positioning Merriweather as a center for the arts, education and culture and making it an important regional and cultural force.” The next year, in 2005, the Columbia Association board considered moving CA headquarters to Symphony Woods, in part as a money-saving measure. However the most important event in 2005 with respect to Symphony Woods was the beginning of a formal planning process for Columbia Town Center, including two “town hall” meetings sponsored by General Growth Properties in May and June and a “charrette” in October, a week-long series of meetings to solicit public comments on the future of downtown Columbia. The charrette and related meetings resulted in the Howard County Department of Planning and Zoning publishing in February 2006 a draft Columbia Downtown Master Plan. This plan treated Symphony Woods, Merriweather Post Pavilion, and the adjoining Crescent property as a single neighborhood for planning purposes, and envisioned it as “a cultural, residential, service retail, and office district”. As for Symphony Woods itself, while envisioning the area as remaining “largely unchanged” the draft master plan noted “opportunities for public amenities such as plazas, pathways, public art, cultural monuments, and a skating rink”, and possibly small buildings “limited to civic or recreational uses”. For various reasons, including a lack of consensus around the details of downtown development, Howard County did not carry this master plan forward past the draft stage. Instead of a master plan the Department of Planning and Zoning sponsored the creation of a more general “framework” document, Downtown Columbia: A Community Vision. Released in draft form in September 2007 and in final form in December 2007, this document stated that “Symphony Woods needs to be preserved and enhanced as the ‘Central Park’ within Downtown” and concluded that “selected new recreational features may need to be added and activities may need to be programmed”. It also recommended “woodland restoration” and the addition of public art. During this period General Growth Properties held its own private meetings with various civic and business groups to discuss its ideas for downtown development. However the Columbia Association was not among them: After having been criticized in October 2005 for having a private meeting related to the downtown Columbia charrette, the CA board in March 2006 prohibited CA President Maggie Brown and other CA staff members from having private discussions with General Growth Properties and Howard County regarding the development of downtown Columbia. Columbia Association board members cited a provision of the Maryland Homeowners Association Act that (except for special circumstances, such as discussions of litigation), “all meetings of the homeowners association, including meetings of the board of directors or other governing body of the homeowners association or a committee of the homeowners association, shall be open to all members of the homeowners association or their agents”. The CA board interpreted (or extended) that provision as covering meetings of CA staff with GGP and Howard County in addition to meetings involving the board members themselves. CA board members subsequently reiterated to GGP in October 2007 their decision to discuss matters of mutual interest regarding downtown Columbia only in public meetings. In April 2008 General Growth Properties presented to the public its own proposed master plan for downtown Columbia. Like the draft Columbia Downtown Master Plan, the GGP draft plan treated Merriweather Post Pavilion and Symphony Woods as a single area for planning purposes (splitting out the Crescent property as a separate neighborhood), and envisioned the combined area, now christened “Merriweather”, as “a new kind of cultural park where the landscape becomes a setting for arts, cultural and civic uses”. The draft GGP plan proposed more integration between Merriweather Post Pavilion and Symphony Woods, with the Merriweather infrastructure “designed to open outward supporting other planned and programmed events in Symphony Woods”, and recommended that the park “be designed for daily use with flexible spaces to be enjoyed in a variety of ways, including places of retreat and isolation from the urban context”. A public meeting between General Growth Properties and the Columbia Association had occurred in early April less than three weeks before, after lengthy negotiations between CA and GGP relating to the time, place, and public nature of the meeting. The meeting itself covered only general discussions about matters relating to downtown Columbia and Symphony Woods, and did not address specific features of GGP’s plan. After the first public unveiling of the draft GGP master plan later that month, Columbia Association board members expressed surprise at GGP’s proposals for Symphony Woods and asserted CA’s right to determine how Symphony Woods should be developed. Beginning in May 2008 and continuing during the summer General Growth Properties held a series of “Vision in Focus” public presentations describing the proposed master plan, as well as a separate “Community Discussions” series to solicit comments on the plan. During the same period the Columbia Association Board of Directors began the process of creating its own alternative proposals for Symphony Woods and downtown Columbia in general. In June the CA board adopted a 17-point position statement that articulated CA’s position on desired outcomes for downtown development, including that “Symphony Woods will be protected and will serve as Columbia’s Community Park”, and in July it adopted guidelines for CA staff discussions with GGP regarding Symphony Woods, including that there be “provisions for a gathering place for individuals and community events” and “limited new roadways or buildings of a park-related scale”. However at this time the Columbia Association did not yet have an actual alternative plan for Symphony Woods, although CA board member Cynthia Coyle apparently created an informal concept plan featuring a carousel, a children’s garden and arboretum, and some sort of water feature.2 In the fall of 2008 the Columbia Association was again approached by Cy Paumier, John Slater, and their associates, who had previously worked with CA in the 1990s on plans for Symphony Woods. After meeting with representatives of General Growth Properties in October regarding GGP’s downtown Columbia plans, in December the CA board approved having Paumier, Slater, and their associates create a CA-sponsored concept plan for Symphony Woods. In the meantime the formal Howard County planning process relating to the General Growth Properties plan had begun, with a submission by GGP to the Department of Planning and Zoning in October 2008. In November the DPZ provided a response to that submission in the form of its Technical Staff Report, intended as a set of recommendations to the Howard County Planning Board. The DPZ staff report also included comments from other Howard County agencies about the General Growth Properties proposal. The Howard County Library System was “excited” about “the concept of a new, state-of the-art Central Library … that would serve as both an anchor and a draw to the ‘Cultural Center Avenue’ described in General Growth Properties’ proposed plans for a revitalized Columbia Town Center”, while the Howard County Arts Council noted that the plan’s arts and culture sections were consistent with the arts recommendations in previous Howard County planning documents, including Downtown Columbia: A Community Vision. Having received the Department of Planning and Zoning report, the Howard County Planning Board held off on making an immediate decision on the General Growth Properties plan, and instead started a series of public work sessions. These sessions, including testimony by interested parties, began on January 8, 2009, with GGP’s response to the DPZ staff report and ran through the winter, spring and summer. As of April 9, 2009, a total of 25 organizations and over a hundred individuals had provided testimony to the Planning Board. Organizations supporting General Growth Properties’ submission included activist groups such as Bring Back the Vision, Columbia 2.0, and Columbia Tomorrow, as well as more established groups like the Chamber of Commerce, Columbia Center for Theatrical Arts, Columbia Orchestra, and the Business Alliance. The activist groups Alliance for a Better Columbia, the Coalition for Columbia’s Downtown, and the Howard County Citizens Association organizations urged GGP to submit a new plan, as did the League of Women Voters. The Columbia Association, along with various Columbia village boards, was recorded as being somewhere in the middle, requesting various types of amendments to the plan but not requesting that it be resubmitted. In particular, with respect to Symphony Woods CA expressed concern that “the two large buildings, underground parking, and several roads proposed for Symphony Woods are in direct contradiction to CA’s vision”, that “CA is very concerned about the removal of many trees in Symphony Woods and wants to preserve the integrity of the parkland”, and therefore “CA does not agree with exchanging existing land in the heart of Symphony Woods for other land” (as proposed by GGP). While the Planning Board was taking public testimony the Columbia Association continued its efforts to produce its own plan for Symphony Woods. On March 26, 2009, the Columbia Association Board of Directors reviewed an initial Symphony Woods concept plan (one of three created by Cy Paumier, John Slater, and associates), approved it, and directed that it be presented to the public. The CA board followed up on August 27 later that year by unanimously approving sending a letter to the Howard County Planning Board notifying it of CA’s intention to present a concept plan for Symphony Woods. A new wrinkle was added to the controversy of Columbia downtown planning in April 2009 when General Growth Properties declared bankruptcy. GGP’s Columbia operations were not part of the bankruptcy petition, and GGP declared its intent to move forward with its proposed plan. However GGP’s financial problems introduced new uncertainty into the long-term development of Columbia according to the proposed plan. On September 17, 2009, after several months of public work sessions and testimony, the Howard County Planning Board finally made its formal recommendations to the Howard County Council regarding the Downtown Columbia Plan proposed by General Growth Properties and the associated zoning regulations (ZRA-113). Concerning Symphony Woods, the Planning Board unanimously recommended “downtown development standards to protect large, mature, specimen trees in Symphony Woods”, that “Symphony Woods be maintained and used as Columbia’s downtown park for passive recreational uses only”,3 and that “there be no buildings on Columbia Association-owned land except for ancillary use facilities, like a small café, to support passive recreational uses”. The board also recommended that “pedestrian connections to the Mall and from Merriweather Post Pavilion be improved to facilitate frequent usage within Symphony Woods” and that “the County Council request a presentation by the Columbia Association regarding its plan for Symphony Woods”. The day before, on September 16, the Columbia Association presented to the public the concept plan developed by Cy Paumier, John Slater, and associates for development of Symphony Woods (a plan CA originally promised to release in April). Shortly thereafter the Columbia Association Board of Directors voted 7-2 to approve the plan for Symphony Woods as presented by Paumier, Slater, and associates. What became known as the “Paumier plan” (more formally, the plan for “Symphony Woods Park”) rejected General Growth Properties’ idea of cultural and civic buildings in the northern section of Symphony Woods in favor of “a plaza to include an interactive water feature and a small café with restrooms” as well as “a children’s play area, sculptures, and future park related uses” (the latter being unspecified in the original Paumier plan). Like the GGP plan, the Paumier plan retained the idea of a north-south alignment to “reinforce the visual axis connecting Town Center with the Pavilion”. The pathway system was proposed to be circular, with the “center of the circle, with a modest amount of tree thinning, [being] a special outdoor room for the community to gather”. November 2009 saw the Howard County Council begin its consideration of the proposed downtown plan, as Council Chair Mary Kay Sigaty introduced two proposed pieces of legislation, Council Bill 58 (CB58-2009) to adopt a downtown Columbia plan as an amendment to the Howard County General Plan 2000, and Council Bill 59 (CB59-2009) to implement the necessary changes to Howard County zoning regulations to enforce the plan’s provisions. The Council held public hearings on the bills in November and again in January 2010 before moving to final consideration of the legislation at the beginning of February. With respect to Symphony Woods the final version of Council Bill 58 made a number of substantive changes from the bill originally introduced (which reflected the General Growth Properties plan). Amendment 7 (together with Amendment 1 to Amendment 7, which made additional technical corrections) retained the language in the GGP plan calling for “a new kind of cultural park where the landscape becomes a setting for arts, cultural and civic uses”, but emphasized the integration of Symphony Woods into this vision by designating the combined Merriweather Post Pavilion and Symphony Woods properties as the “Merriweather-Symphony Woods Neighborhood”. Amendment 7 also removed the language in the General Growth Properties plan referring to buildings in the northern section of Symphony Woods, and replaced it with language referencing “compatible commercial uses such as a café in the park or museum shop”. Similarly, language referring to “park drives” through Symphony Woods was replaced with language referencing “a new system of paths and infrastructure [that] will support festivals and other events in the park”, with “access through Merriweather-Symphony Woods that connects the civic and cultural uses [that] will be compatible with the topography”. However Amendment 7 retained language from the GGP plan referencing “a new north/south axis from Market Square at The Mall” and “a new Fountain Plaza which connects to Merriweather Post Pavilion”. CB58-2009 and CB59-2009 were unanimously approved by the Howard County Council on February 1, 2010, with the Columbia Flier singling out Council Chair Mary Kay Sigaty as “largely credited with leading council members through revising the plan”. Both bills were subsequently signed by Howard County Executive Ken Ulman on February 3, and the new plan from CB58-2009 officially published as the document Downtown Columbia Plan: A General Plan Amendment. In the meantime the Columbia Association continued to move forward with the Paumier plan for Symphony Woods Park. In April 2010 the CA board directed staff to prepare for a groundbreaking in May, and on May 18 CA leaders thanked local legislators Sen. Edward Kasemeyer and Del. Elizabeth Bobo for their help in securing a $250,000 grant from the state of Maryland, and welcomed the promise of another $250,000 grant from what the Baltimore Sun termed a “mysterious area nonprofit” from outside Howard County that wished to remain anonymous. However on May 20 Columbia Association President Phil Nelson informed the CA board of a potential roadblock to CA’s development of Symphony Woods, due to new Howard County planning processes imposed by CB58-2009 and CB59-2009, including so-called “CEPPA” requirements (for “Community Enhancements, Programs and Public Amenities”). While some board members thought the Columbia Association was exempt from such requirements (board member Cynthia Coyle remarked, “The curiosity I have is why would we be held up by a CEPPA”), Nelson recommended on June 29 that “CA work through the development process that the County has imposed in CB58 and CB59“, warning that “by demanding and being granted an exemption from the rules and regulations that the County Council feel are in the best interests of the residents of Columbia and Howard County, CA will be the one that opens the door to the possibilities of bad planning and judgment”. In July the Columbia Association put out an request for proposals for consultants to work on the design and development of Symphony Woods Park, including creation of the Final Development Plan, Site Development Plan, and related documents needed for the planning process.4 By November planning work was well under way, with construction projected to start in late 2011. One complicating factor arose with the planned fountain, namely that the Howard County Bureau of Environmental Health advised that “restrooms must be provided in order to receive Health Department approval for a building permit for an interactive fountain”. November 2010 also saw a major change in the world of downtown Columbia development as the newly-created Howard Hughes Corporation was spun out of General Growth Properties as a separate company to handle GGP’s planned community portfolio. In addition to ownership of Merriweather Post Pavilion and the Crescent property, Howard Hughes also assumed GGP’s responsibilities for planning in Columbia Town Center. Planning work continued on Symphony Woods Park. As of December 15 a “Phase 1 & 2 Design Development Plan” being considered by the Columbia Association Planning and Strategy Committee had changed the circular pathway system of the concept plan to an elliptical pathway, with a fountain and accompanying snack shop with restrooms (presumably to satisfy health department requirements) on the southwest side of the ellipse. The snack shop backed up against the Merriweather Post Pavilion fence, with access to the pavilion still through the traditional east and west gates. As in the concept plan there was a grand staircase down to the pathway system from Little Patuxent Parkway across from the mall access road, in line with the Downtown Columbia Plan language about “a new north/south axis from Market Square at The Mall”. However the staircase design did not include any ramps to address accessibility concerns. This design was used in the preparation of a draft Final Development Plan prepared for review by the Columbia Association Board of Directors in March 2011 in advance of a future public pre-submission meeting for the project. At about the same time Cy Paumier created and submitted an alternative design drawing for review by the board. In April the Strategic Implementation Committee of the Columbia Association reviewed a new alternate “Plan B” layout for development of Symphony Woods, presumably based on Cy Paumier’s new design. This new design eliminated the elliptical pathway system of the previous design in favor of a cruciform system in which a north-south pathway ran from the grand staircase at Little Patuxent Parkway (retained from the previous design) south to a point across the Merriweather Post Pavilion fence from the Merriweather restrooms. An east-west path crossed the north-south path at a circular plaza with a fountain at its center. The snack shop was no longer in the design, but a location for a possible future café was noted at the south end of the north-south path next to the Merriweather fence. As in the previous design, the grand staircase at Little Patuxent Parkway lacked an accompanying ramp. In early May the Strategic Implementation Committee recommended that “the CA Board of Directors approve the Staff to redirect the work of the project team” to produce a Final Development Plan for the new Plan B design, and on June 9 the CA board unanimously adopted the new design. CA subsequently presented this design to the public on June 16 in a so-called “presubmission meeting” prior to submitting the new Final Development Plan to Howard County. By July 2011 the schedule for the groundbreaking on the Symphony Woods Park project had been pushed back to March 2012. In the next stage in the process the Columbia Association presented the new design to the Howard County Design Advisory Panel on July 13. The 36-page presentation included two plan renderings of the new cruciform pathway system, a drawing of the proposed staircase from Little Patuxent Parkway down to the north-south path, and a concept drawing of the fountain and café marked “for discussion purposes only”. At the July 13 meeting various Design Advisory Panel members criticized the design as lacking a suitable vision and “strength of design”, and the panel as a whole recommended (among other things) defining a “specific vision for this site” and providing “more clarity to a theme for the neighborhood”. Taking stock after the presubmission meeting and Design Advisory Panel meeting, Columbia Association staff noted that key issues raised at the presubmission meeting included “accessibility, restrooms, the fountain, circulation inside the park, connectivity to the park, parking, and [the] master plan” and made a number of recommendations, starting with adding a ramp to the staircase into the park. As for the Design Advisory Panel meeting, CA staff agreed that the DAP motions “[reflected] the feeling … that the ‘big picture’ for the park must be more fully developed and shared with the community” and noted that “we have all been focused on getting phase 1 constructed”. The staff concluded that “it would be beneficial to develop a clear and inspirational vision statement that reflects the site attributes, the Board’s desired outcomes and the context in Town Center”. At the September 8 Columbia Association board meeting the Planning and Strategy committee recommended adopting a new vision statement for Symphony Woods. The 11-paragraph draft statement began, “Symphony Woods Park will be Columbia’s central park one day and will be a place of music, the arts and nature.” The statement went on to note, “The central issue in designing Symphony Woods Park is to create access through the woods in a way that protects the trees and the natural landscape while supporting use of the park by greater numbers of people”. The CA board subsequently approved a vision statement on October 13 after amending it in various ways.5 The vision statement envisioned Symphony Woods as “Columbia’s central park”, “a breathtaking gateway to Merriweather Post Pavilion”, and “a place that celebrates music, arts and nature”. The statement also envisioned Symphony Woods as providing “venues for energetic, creative activities such as community fairs, cultural events, art & craft vendors, local artists and spaces for reflective respite”. Work on the park project continued, with a contract awarded later that fall for the design of the planned fountain. At a meeting of the Columbia Association Board of Directors on January 26, 2012, various options for the fountain were presented to the board, with the board members offering their respective critiques of the designs. Meanwhile Columbia Association staff were working with the Howard County Department of Planning and Zoning to progress the Symphony Woods Park project through the county planning process. On March 5, 2012, CA submitted a Final Developmemt Plan for the park to the county, along with other required documents. The first Howard County Planning Board meeting on the FDP and related submissions was scheduled for June 21. On June 28 the Department of Planning and Zoning issued a Technical Staff Report on the Columbia Association’s Final Development Plan for development of a park in the 16-acre northern section of Symphony Woods, FDP-DC-MSW-1. This FDP included not only the pathway system, fountain, and café previously discussed, but also a “shared use pavilion” and “shared use amphitheater” to be available for both Symphony Woods and Merriweather Post Pavilion events, as well as a “play activity area” and “woodland garden area”. The pathway system was the north-south/east-west cruciform geometric arrangement from the Plan B design, with other paths leading in curved arcs from Little Patuxent Parkway to the proposed shared use pavilion at the Merriweather fence and then back out to Little Patuxent Parkway. Other than mention of the shared use facilities the FDP as presented showed minimal integration with Merriweather Post Pavilion, with the entrances into the pavilion some distance from the proposed features, and the proposed north-south pathway dead-ending at the Merriweather Post Pavilion fence across from the Merriweather restrooms. The Planning Board held a public meeting on the Columbia Association’s proposals on July 12, with testimony from both CA representatives and the general public. Concern over the trees in Symphony Woods was a major theme of the testimony, with several people objecting to the removal of mature trees. According to CA testimony the estimated number of trees to be removed was 64 in a “worst-case scenario” involving the proposed pathway configuration; however this did not address trees to be removed within the area of Merriweather Post Pavilion or (apparently) in the Symphony Woods locations where the shared use amphitheater, pavilion, café, play activity area, and other as-yet-undesigned features were to be located. On July 19, 2012, the Planning Board voted 5-0 to approve the Final Development Plan, but did not release its final “decision and order” until September 6 after a vacation break. That decision reiterated comments made by Planning Board members in the July 19 meeting, and formally recommended that the Columbia Association make certain key changes to its proposals. One of these was to reroute pathways to avoid removal of trees, “consider[ing] existing topography and vegetation, and adjusting paths to meander around healthy trees to increase the number of trees that may remain”. The other change was to develop a plan for integration of Symphony Woods with Merriweather Post Pavilion, with the Planning Board emphasizing “the need for the development of Symphony Woods Park to coordinate with the redevelopment of Merriweather Post Pavilion”, recommending that the plan “maximize potential interaction with Merriweather Post Pavilion with shared use facilities and cross access between the sites”, and noting that “concepts employed in the park should increase opportunities for year-round use”. In the meantime a Columbia Association staff report (dated August 17) and an accompanying presentation at the CA board meeting on August 23 discussed how to proceed in the light of the Planning Board decision. The staff report noted, “This point in the process is an opportune time to consider the park plan in light of other recent planning efforts”, citing parallel efforts by the Howard Hughes Corporation to redevelop Merriweather Post Pavilion, including “a dramatically different concept for Merriweather–Symphony Woods that includes many new uses on CA land and on HHC land that will, if implemented, make the neighborhood more like the cultural park envisioned in the Downtown Plan”. Columbia Association staff presented three possible courses of action: “stay the course” (i.e., continue with the existing design), “pause until plans for Merriweather take shape” (as part of a collaborative effort with Howard Hughes), or “pause but increase programming and enhancements” (i.e., to encourage increased use of Symphony Woods). The staff recommended the third option, including collaboration with Howard Hughes on a Merriweather-Symphony Woods master plan, noting that “it would allow for the best possible chance for a design solution to create an integrated Merriweather-Symphony Woods Park destination”. On October 11, 2012, the Columbia Association Board of Directors meeting featured a public presentation of such a new design concept for Merriweather and Symphony Woods. That concept included a new vision for what Symphony Woods could be and a new strategy for realizing that vision, as part of what became known as the “Inner Arbor” plan. The next article in this series will address that vision and strategy, and how they ultimately led to the current design for Merriweather Park at Symphony Woods, of which the Chrysalis amphitheater will be the first element.